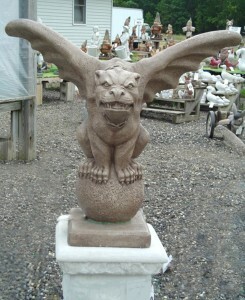 So what started the gargoyle craze that continues to this day? In 12th century Europe, gargoyles were commonly used on buildings to divert rainwater through their mouths. They were used quite often on the outside of cathedrals. One of the most famous being the Notre Dame Cathedral in France. evil. This however can’t fully account for their huge popularity during the Middle Ages. The majority of gargoyles were patterned after Celtic deities that existed before the dawn of Christianity. The stories of these Celtic Deities were passed down through folklore from person to person. Their likenesses stayed on as images of good luck and protection. The church tolerated these images because they knew that they could not replace such an old pagan belief system so quickly. As they have throughout history, gargoyles remain very popular in today’s culture. They are mainly used for decorative purposes in gardens or in homes. With the upswing in the popularity of both Goth and Celtic traditions, gargoyles are just a natural extension of this interest. Back in 1972, a movie called Gargoyles was made starring Cornell Wilde. This told the story of a group of gargoyles hidden in the Arizona desert who are waiting for another 600 year hatching cycle. Cornell Wilde plays an anthropologist who specializes in demonology and the occult. Jennifer Salt plays his teenage daughter that tags along during the gargoyle investigation. I remember watching this when I was 16, along with some of my friends. We really thought it was scary. Though cheesy to some, I feel this was one of the best made for TV movies of its day. If You Enjoyed This Article About Gargoyles Or The Gargoyles Movie Please Like Or Share Below! As a retired history teacher with a particular interest in the Middle Ages, I really enjoyed your article about gargoyles. It is rare to find someone who really knows their stuff. Good job. I am flattered that you enjoyed the article, Wilber. Thank you so much!